I think Baby corn is one of my most favorite vegetables.I can have it in any form,fried baby corn or baby corn curry or mixed in pasta dishes,it remains a delicious affair.I've been steering clear of Manchurian dishes of any kind off late thanks to the amount of oil required for frying.As is the norm after any holiday or binge outings,I am on a self proclaimed diet-exercise regimen,so can't find an excuse there either. I've tried a no-fry cauliflower manchurian before.To give it it's due,it was delicious but give me a fried version anyday!So I'd be lying if I said I wasn't apprehensive before trying this out.But if you chose tender baby corn,it really takes only a little time to cook,so shallow frying works perfectly fine. Making the manchurian sauce is the next step.I usually follow a very simple recipe with basic ingredients for Indo-Chinese cooking.However,you can add/subtract ingredients of your choice. 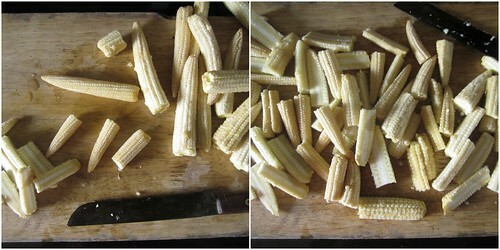 Wash and wipe clean the baby corn and cut into half lengthwise. 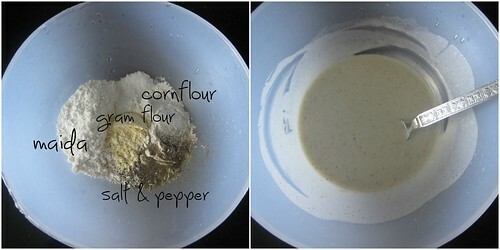 Make a batter using the ingredients mentioned-starting with flour,cornflour,salt,pepper and water. 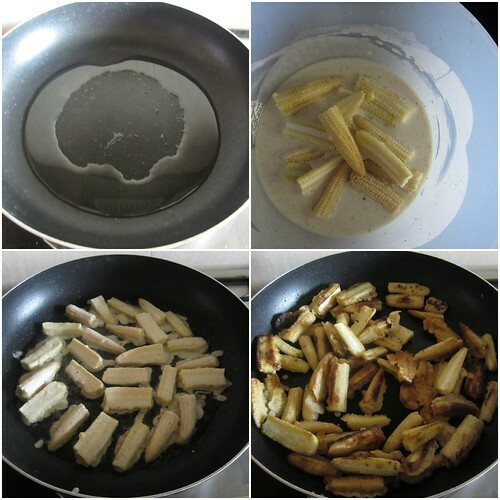 In a shallow frying pan add 1 tbsp oil.Dip each baby corn pieces into the batter and place evenly on the hot pan.Let it brown on one side then flip over and cook the other side.It may take anywhere between 5-10 minutes for the baby corn to cook,brown and crisp up. 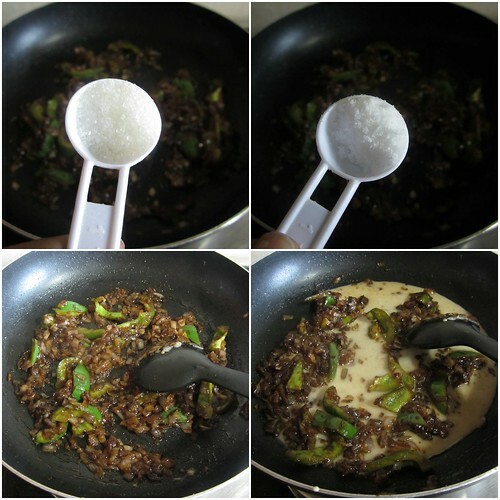 Meanwhile make the manchurian sauce.In a non-stick pan add oil and saute the onions and green chilly till golden brown. Mix in the ginger garlic paste and saute for 3-4 minutes or till the raw smell goes. 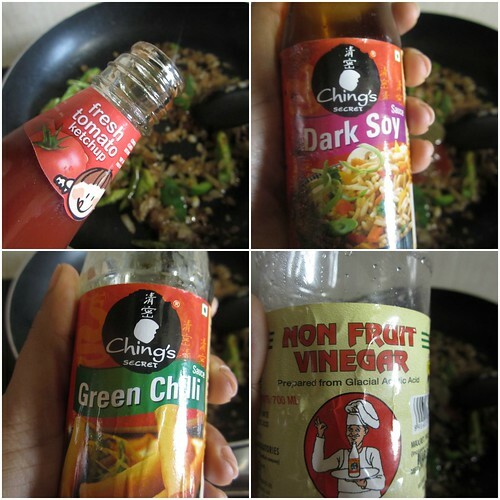 Add the chopped capsicum,tomato sauce,soya sauce,chilly sauce,vinegar,sugar and salt to taste and stir well. Now add the cornflour slurry and mix well till you get a thick manchurian sauce. 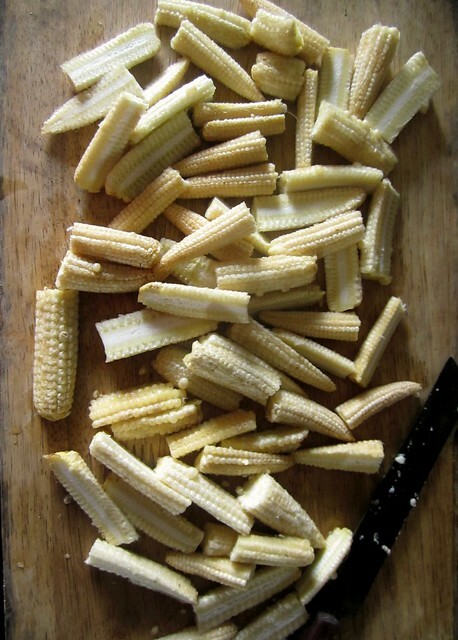 Mix in the shallow fried baby corn and stir well till the pieces get coated with the sauce and turns crisp. Ooooh, I love this and am gonna try for sure. I love the fact that there is no deep frying. :-).. After looking at these pics, my dinner sounds and looks so dull! Okay that looks yum and am definitely trying this! I was steering clear of manchurian for the very same reason! Looks easy & healthy as no deep frying.. Yummy one ! 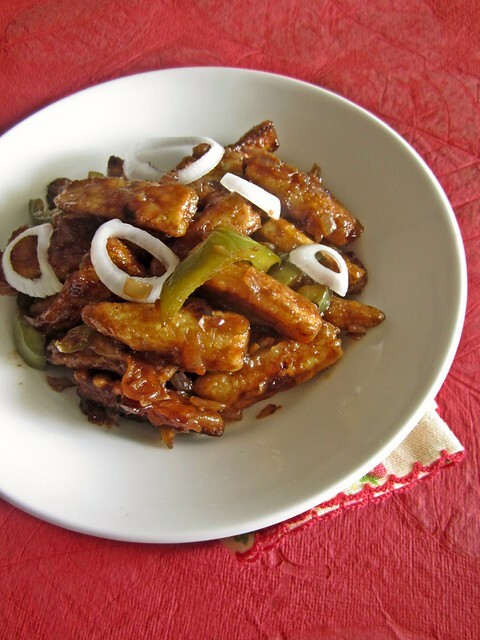 delicious and awesome manchurian with lovely clicks. thanks for the link love divya. 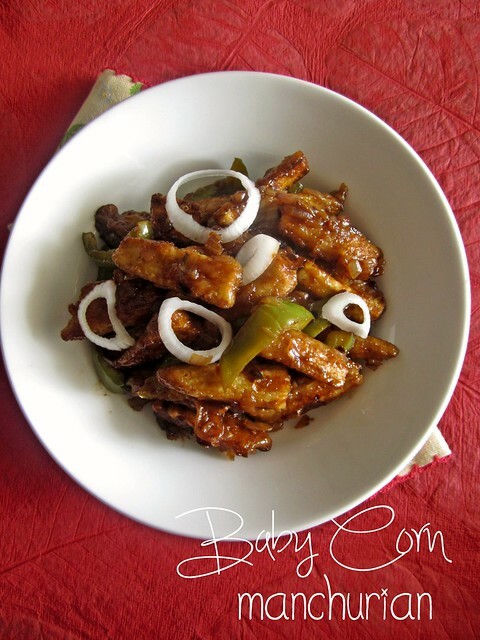 baby corn manchurian is looking delectable and the second pic of the sliced baby has lovely light. Definitely a must try recipe :) looking too good ! This manchurian looks amazing. Imagine if its no fry. I also make this the samw way. I use my sear pan and them and then use them in the manchurian sauce. It looks so yummyyyy... But when I tried this its so sticky n also I didnt get this color... Can you tell me the reason ?? ?